This summer, one of my primary writing projects has been composing new short stories related to my Civil War novel, Hagridden. Each story involves a minor character or two from the novel, people who have some important moments in the book but are definitely supporting characters to the main narrative; in these stories, those folks get their own narrative. It tells the story of the captain whose wrecked ship was meant to carry “the girl” and her family to Galveston, Texas, but instead stranded them in Leesburg, Louisiana. Captain Brewster, like the girl, is stranded, and he travels the coastal towns looking for a new ship to hire onto — but what he finds will haunt him! I said, “I know, Grandpa. It’s why I named the character that. I remember all your stories.” Those stories, by the way, make their way into Captain Brewster’s stories for the children of Leesburg. Fighting off a gang of armed Cubans, detecting enemy ships — versions of those events actually happened to my grandfather (if you believe his stories . . .). 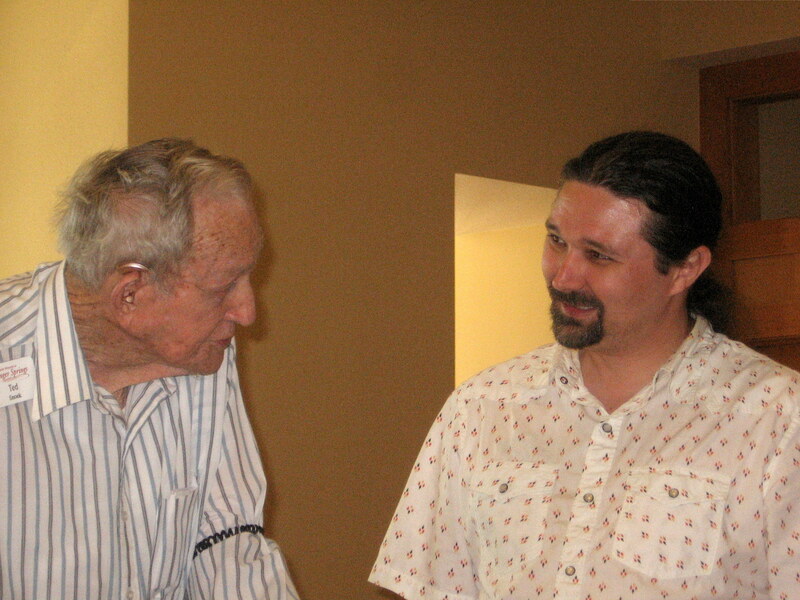 With my grandfather in Boerne, TX. You can read the first of these supplemental stories, “What Have You Done to Deserve Such a Halo,” in Bartleby Snopes. And more Hagridden-related fiction is coming soon! And the novel itself is out and doing well! Don’t own a copy yet? Find one in a bookstore near you! Or order one online! The Portland release party: photos! I’m half way through the novel and have bookmarked those stories.